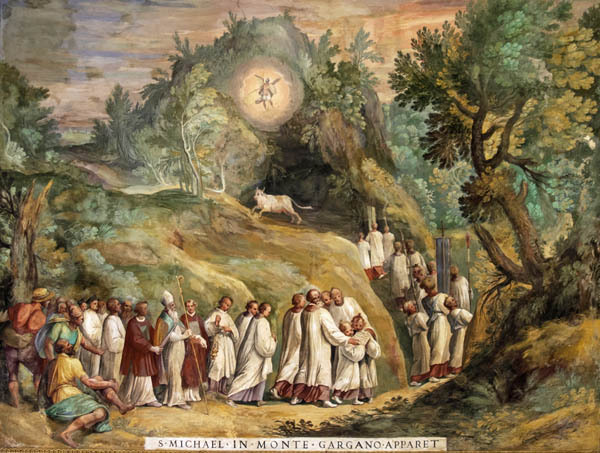 A celebrated apparition of the Archangel took place, under the Pontificate of Gelasius I, in Apulia, on the top of Mount Gargano, at whose foot lies the town of Siponto. A bull belonging to a man who lived on the mountain, having strayed from the herd, was, after much searching, found hemmed fast in the mouth of a cave. One of its pursuers shot an arrow, with a view to rouse the animal by a wound; but the arrow rebounding struck him that sent it. This circumstance excited so much fear in the bystanders and in them who heard of it, that no one dared to go near the cave. The inhabitants of Siponto, therefore, consulted the Bishop; he answered that in order to know God’s will, they must spend three days in fasting and prayer. At the end of the three days, the Archangel Michael warned the Bishop that the place was under his protection, and that what had occurred was an indication of his will that God should be worshiped there, in honor of himself and the Angels. Whereupon the Bishop repaired to the cave, together with his people. They found it like a church in shape, and began to use it for the celebration of the divine offices. Many miracles were afterward wrought there. Not long after, Pope Boniface dedicated a church in honor of St. Michael in the great Circus of Rome, on the third of the Kalends of October (September 29), the day on which the Church celebrates the memory of all the Angels. But today’s Feast is kept in commemoration of the Apparition of St. Michael the Archangel. be attentive, very attentive, to the prayer of the Rosary. – John Paul II, interview with Catholics at Fulda, Germany, Nov. 1980, p. 51. We take up this trial through personal holiness. No one will be exempt from involvement, so don’t think you can sit this one out. We are all lacking in personal holiness, but holy or not, we are all swept up into the great battle between God and satan. If we haven’t answered the call to holiness up to now, then it’s time to get started. Discouragement is the weapon of our enemy, so dismiss his lies that you can never achieve holiness, that you can never be worthy. God looks for our fidelity, not our perfection. It is in persevering fidelity that we can reach perfection. In these days we must turn to the Sacraments, especially confession and the Eucharist, Our Lady and her Rosary, and St. Michael, the prince of the heavenly host, who will battle and defeat the prince of this world. “Couragio!,” as Padre Pio liked to say. The task of saving souls might be frightening because of the heavy responsibility God has entrusted to us, but it is also a privilege that the God of all creation, Our Father, asks us poor creatures to help build His Kingdom. If we are up for the task we can be sure that His abundant grace will sustain us. This entry was posted in Saints & Angels, The Church and tagged Gargano, Pope John Paul II, Rosary, St. Michael by texasnuns. Bookmark the permalink. And thank you, dear Sisters.